We are bringing you a series of Christmas gift guides to celebrate the Etsy Made Local Christmas Market 2017 on 2nd December 2017 in Tooting, London. All of the products featured in this gift guide series are made by the designer-makers that will be exhibiting and selling at our market. It's going to be an amazing market, full of unique items made by expert local crafts-people and designers, so you won't want to miss out! This week, we're bringing you a gift guide for teachers. Whether the gift you're looking for is for your own teacher; your kids' teachers; or perhaps a relative or friend who's a teacher themselves, this gift guide will give you some fabulous ideas. With 8 different colours to choose from, you may have a tough time deciding which colour to go for. But we think this is a lovely little gift to show how much you've appreciated your teacher. 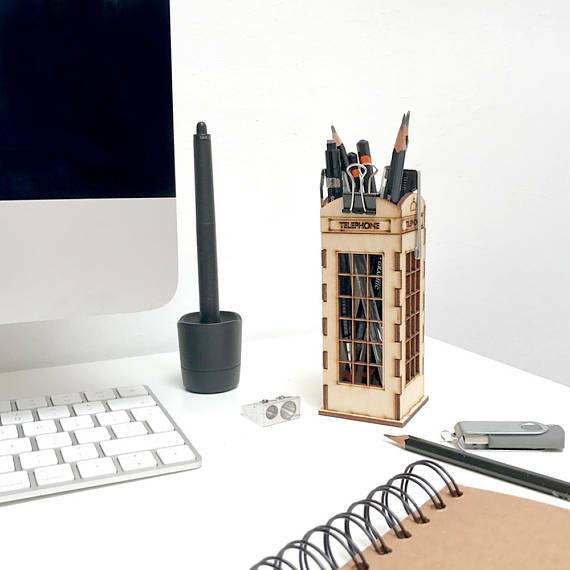 What's more useful than a desk tidy? This is a really practical gift, that doesn't scrimp on style either. We love this modern interpretation of the traditional red phoneboxes that you just don't see so often any more. If your teacher is a little more of a lover of sparkly things rather than simple things, your teacher will love this pencil case! You can ask Oh Squirrel to personalise the pencil case with your teacher's name or a positive message, making this a really thoughtful gift. Come to our Etsy Made Local Christmas market to discover more amazing designers, like the ones we've featured in this post. We will have over 40 designer-makers selling their goods at the market. In the run up to Christmas, we will be sharing plenty more blog posts in the form of handy gift guides. Of course, there's nothing like going to the market itself. Going in person means making your own discoveries and finding your own new favourite local designer-makers. So, make sure you save the event in your diary.